With a Hanover Tool Exclusive 8-Set, you’ll have the right size and depth TEKTON socket for every project right at your fingertips. 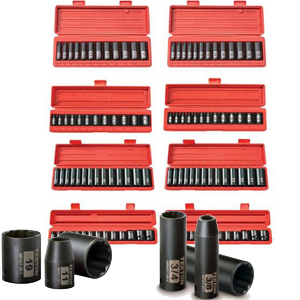 Covering a wide range of sizes, the 12-point TEKTON Chrome Vanadium Sockets are built for use with impact wrenches to loosen the most stubborn 12-point fasteners commonly found in European cars without stripping them. TEKTON impact sockets are more resistant to drive end round out than standard impact sockets, resulting in a longer useable life.